Common Purpose a clandestine, secretive, underhand and much questioned claimed Charity turning over £Millions from the public purse based largely on a thinly disguised pretence of ‘Training’ which is notably more about selection to participate in their ambition to ‘Lead Beyond Authority’ would seem to ‘Lead Beyond Responsibility & The Law’ according to The ICO. 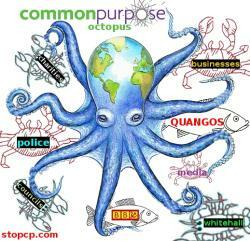 Common Purpose as a charity I have EVERY reason to believe is mallign to the point of evil, secretive to the point of corrupt, exploiting charitable status to the point of fraudulent, infiltrating and influencing democracy to the point of criminal – a pollutant on the body politic, a poison in the media, toxic in education, dishonest in intent and utterly self serving in its doctrine. It is hard to disagree in my opinion! Possibly the only honest thing about Julia Middleton and Common Purpose of which I am aware is the title of Julia Middleton’s book ‘Beyond Authority’ advocates actions which many would consider to be ‘Beyond responsibility’ and some would consider ‘Beyond Morality’. The tacit approval of government to this faux charity functioning like a cancer in our society to undermine and hollow out our own democracy speaks volumes of our own government. Leadership training charity Common Purpose has been told by the Information Commissioner’s Office that it has probably broken data protection law. Information commissioner Christopher Graham received five complaints about Common Purpose earlier this year. The charity had compiled a database of requests for information about Common Purpose made to public authorities under the Freedom of Information Act. The database contained personal details of the complainants (20 January, page 4). The charity sent the database to public authorities receiving new freedom of information requests about Common Purpose. At the time, the charity said it had done this to show how many such requests were being made and to help the authorities decide whether they were vexatious (6 August 2008, page 3). The ICO has now written to one of the complainants, Michael White, saying it thinks it is unlikely that Common Purpose has complied with the Data Protection Act. The letter says no one would reasonably expect “information which was provided to one local authority in order to deal with a specific request to be passed on to multiple other public authorities”. The letter says Common Purpose will be given 28 days to submit any information that suggests this assessment should be changed. A spokeswoman for Common Purpose said the charity would respond within the time limit. White told Third Sector his name and address appeared on the database. He said he was not part of any campaign against Common Purpose and was interested only in establishing its relationships with government, the police and the NHS. Previous Previous post: #G189* – Ellen MacARTHUR SUDDENLY A SCIENTIST!!! Next Next post: #G191* – Michelle OBAMA SHOWS BENEFITS of SLAVERY! !